Home ♦ Build ♦ DIY Baja – The Return of the Pig! 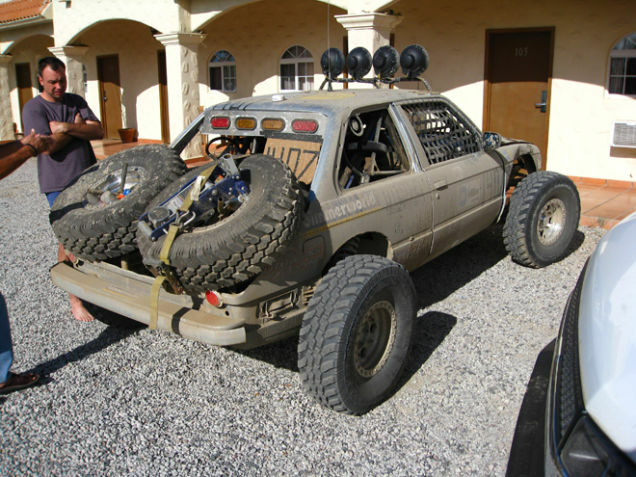 DIY Baja – The Return of the Pig! 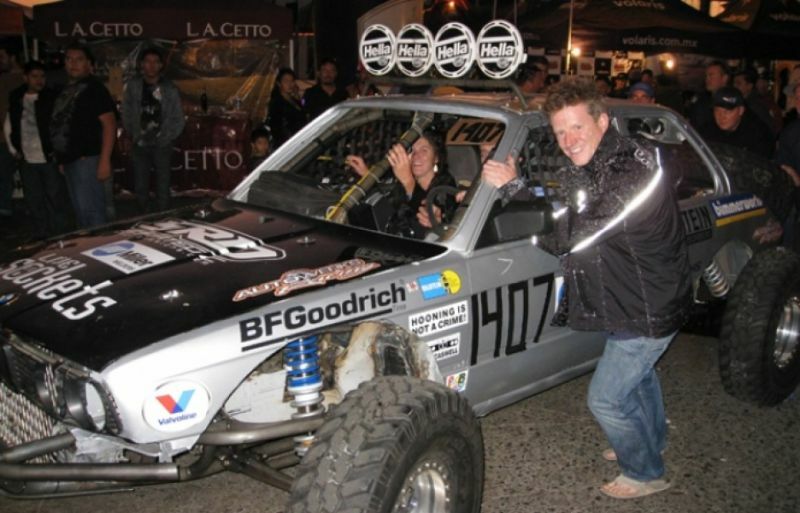 Six years ago I built a BMW for the Baja 1000 in just 14 days. We knew the car wouldn’t survive the full 1000 miles but Miller Welders dared me to even make the starting line. Even one mile in the race would be a huge success. We succeeded and made the race, but the car only lasted 200 miles before the steering failed. I fixed it in the desert, but I wasn’t confident in the steering. So we drove to a motel in San Felipe and the next day found our friends to tow us home. 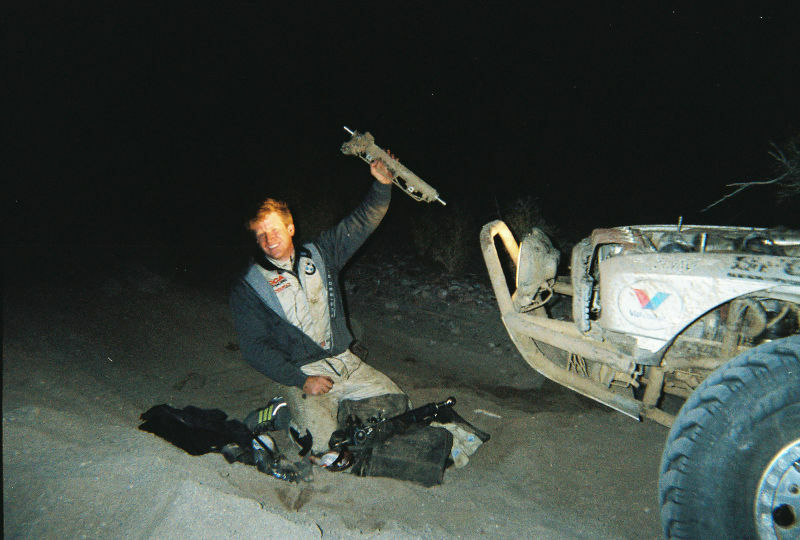 Sure there are huge teams running the Baja 1000 with major sponsors like Red Bull, Monster, and Rockstar but the majority of the Baja 1000 is run by small teams of friends that built their own vehicles. I’ve built track cars, Lemons cars, rally cars, a Scout for Baja, and even an E30 M3 for The Pikes Peak International Hill Climb, but I had never seen a Baja 1000 truck before. I was raised in Chicago and desert racing vehicles don’t really exist in the suburbs where they filmed Home Alone. The other problem is that I’m self-taught. I learned to work on cars from books. I learned to weld from books. I even learned to race from books. But if you’ve never seen what you’re trying to build, it can be very difficult for a DIY racer to build one themself. 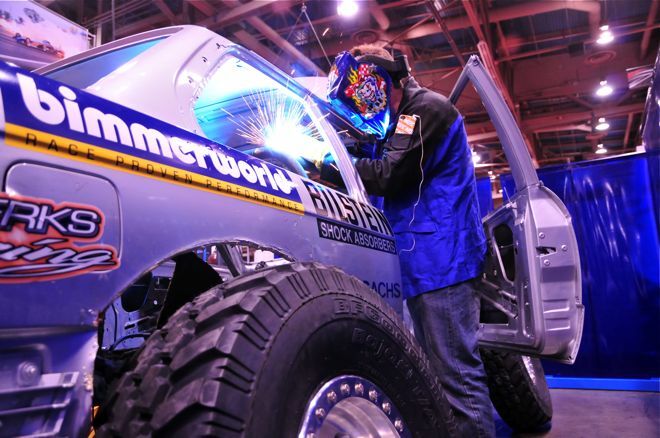 The SEMA floor was way harder to build a car on then I ever expected. There was no room to work, no place to stack steel or parts, and Miller arranged 57 interviews during the 4 days. The real problem is that you can only work from 9-5 in the convention hall, and I typically need 18 hours per day when building a racecar under a tight timeline. So, we did what any other DIY racer would do and hit all the parties at night. It was awesome! 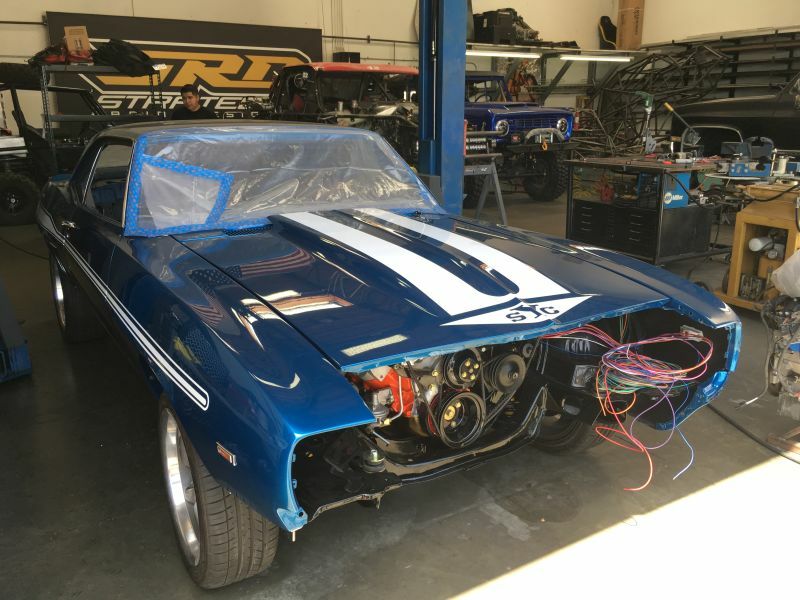 The car left SEMA still needing the front suspension and the forward part of the cage. I had to weld in mounts for a giant speedway quick change diff and get a new driveshaft made. We needed to wire the car, plumb the car, install seats and safety gear and pass the toughest tech inspection I’ve been through short of WRC Mexico. So I did the best I could given the circumstances, but there was no way to fully redesign a BMW in just two weeks to run the longest, toughest race in North America. I didn’t know where to begin, so I went to the basement and found my old Team Associated RC10 and studied it. (Which really means I copied it as much as possible.) I quickly realized that the steering and front suspension would be the most complicated part to design, and that the inboard mounts for the suspension need to be on the same plane as the steering, and that plane needs to be constant as the steering cycles lock-to-lock which means the attachments to the front uprights/spindles need to be on the same plane, as well. I could weld up a system that would do that but everything would need to be based around the steering rack and it would be too complicated to re-engineer all the steering on the floor of SEMA – plus I wasn’t allowed to start until we dropped the bare E30 chassis on the convention floor. With all that in mind I stuck with the stock BMW steering rack. I knew it would be our weak point so I planned to carry a few spare steering racks and change them every 200 miles. I didn’t know what else to do, but I knew I could make the start if I just cut a few corners. SEMA ended and we loaded the trailer and headed for San Diego. Miller didn’t pay me a cent for the build, so I was trying to keep costs low and we were going to finish the car down at the beach. Miller did give me a huge generator, a portable welder and other machines so I could pull it off, but working at the beach has its own problems. It’s hard to weld in strong wind. Sand gets everywhere and the police were starting to look at us funny. So, I traded him everything Miller gave me to rent a spot in his shop and help cover labor. Justin and his wife, Heather, pulled the car off the trailer a few minutes later and we all got to work. 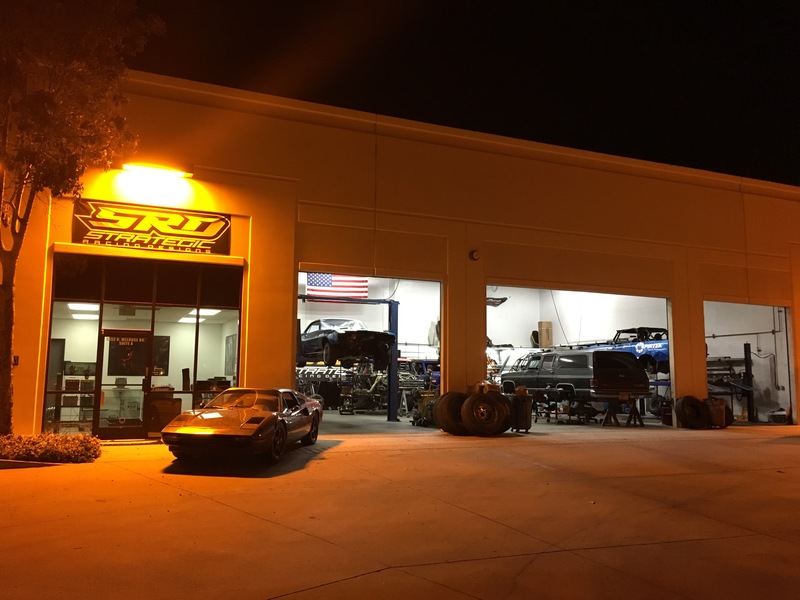 I’ve never seen a shop like Strategic Racing Designs (SRD) in my entire life. They prep trophy trucks and wild creations for the desert, but Justin and Heather Hermann are unlike any shop owners I’ve ever met. First off, they both race. 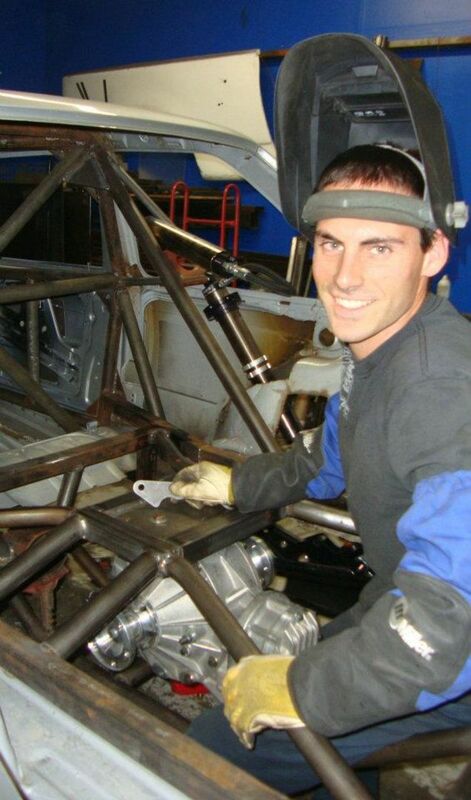 Justin started in Supercross and holds numerous Baja 1000 wins on motorcycles and buggies. Heather has her own class 1600 buggy and used to run a class 5 car – she’s won championships in both! She can also fabricate, but really she holds a Masters degree, teaches, and recently turned down a job at Harvard – there’s not much desert racing in Boston. They also have grown like crazy since I met them and now operate out of this nearly 8,000 sqft space! I can’t help but to promote my friends. Seriously, take a look at SRD’s shop. That’s a perfect Yenko cloan, a modern Jimco Trophy Truck , the nicest Bronco I’ve ever seen, a Trophy lites chassis on huge chassis fabrication table, my Scout, and that’s world’s first electric Ferrari! Next to the wall on the right is the CNC room and next to that is the motorsport shop. Nearly 8,000 square feet See why it’s my favorite shop? 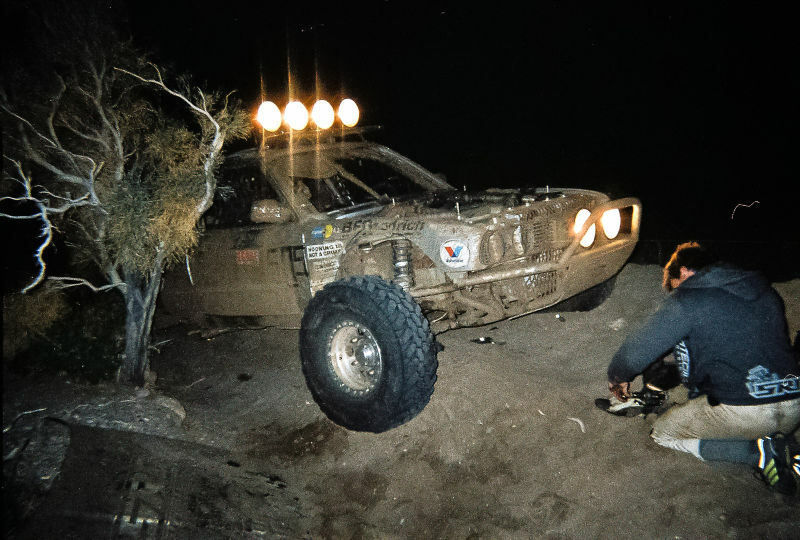 My friends and I worked through the night at their shop for a week (the next article will cover the full build, the parts used, and why we did things the way we did) and headed down to the Ensenada the night before the 1000. We barely made tech inspection but we were officially in the race. Unfortunately we never had time to test and in reality had only drove around the parking lot while loading the trailer. Even just one mile in the race would be a huge success. But that’s the nature of the DIY racer. 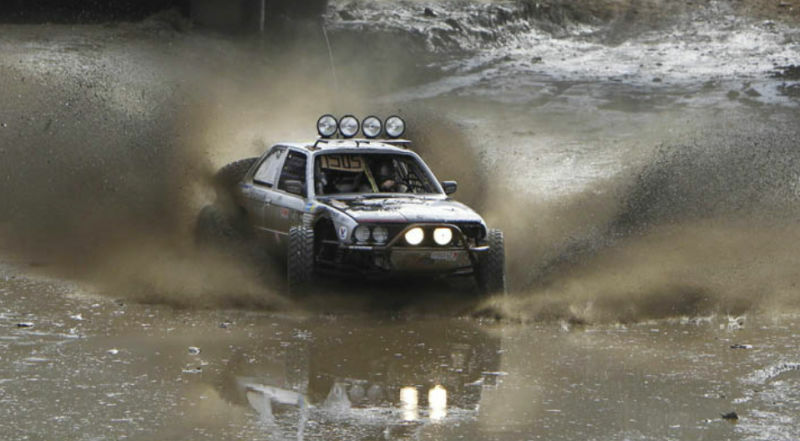 It’s easy to make a race when a giant company builds the car or when you spend $400,000 to prep a $750,000 trophy truck built by say Jimco – yes that’s what a trophy truck costs. But for the little guy without a shop, building a car with his friends, its nearly impossible. Yet, thanks to Justin, Heather, SRD, and my awesome group of friends we pulled it off. Now for the race. It was mess. Our chase vehicle was a rented van with 2wd and no limited slip. It got broken into the night before the race and all of our computers and cameras were stolen. We woke up to a leaking steering rack. Before the race even started we spent the morning, when we were supposed to be gridding, changing it. As the chassis was built around the steering we quickly found issues with clearance for wrenches. But, we kept going. We never learned to use the fish finder mounted on the dash and quickly discovered our new race radio didn’t work. It was fine within a few hundred feet of everything, but once we left Ensenada, we were very alone in the desert. If I crashed or broke out there I had no way to get the car back to civilization. But whatever. We were racing the Baja 1000! The course was awesome. Huge jumps, giant berms on the outside of corners, and a thing called the goat trail which is nuts in little BMW 325i. The whoops on the other hand sucked. I couldn’t run across the top of them like the trophy trucks so we took a beating like the VW bugs running the race. I did my best to not smash a tire on a rock and shatter the steering but I forgot that the deep sand would naturally spread the wheels out and rip the tiny BMW steering rack to pieces. It kept getting sloppier and by race mile 200 it snapped. We got out and went to put the new rack in when I realized all our tools were stolen, too. I found a crescent wrench and large vice grips that the thieves missed and started taking the Baja Pig Apart. I got everything undone but the rack wouldn’t come off the steering linkage. What I would have done for a regular old hammer at that exact moment. I found a rock in the desert that looked like a hammer and made it work. I also smashed my hand and it started gushing blood – I looked for the photograph but all kind is this happy one. 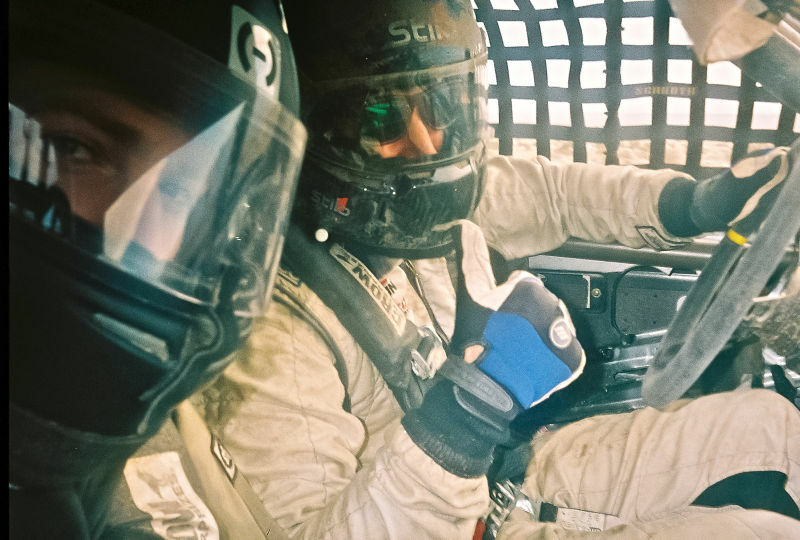 I looked for our duct-tape which must have been in the stolen tool bag and traded gloves with my co-driver Cameron Adams who has slightly smaller hands hoping the compression of the glove would stop the bleeding. We started moving again and the new rack was already sloppy. It would take me another hour to swap it given the tools and the checkpoints would start closing soon. Keep in mind the steering had just snapped and the feeling of loosing total control at speed was still fresh in mind. I saw some lights in the distance that had to be San Felipe and we headed that way into the desert. We found a motel and called it a race. The hotel manager took one look at us and said we must do something before checking in…. he left and came back a moment later with three beers! The next day the motel owner loaned us some clothes (we only had our firesuits) and we found some friend’s at Pete’s camp for beers. Our friends finally showed up and a bunch of us all took turns driving the Baja Pig around town, through the ocean at low tide, and jumping it alongside the road in front of the hotel. I even let the hotel manager take a few laps as he used to race himself. It was an amazing two weeks. We made so many mistakes it’s hard to remember them all, but we did two things right. 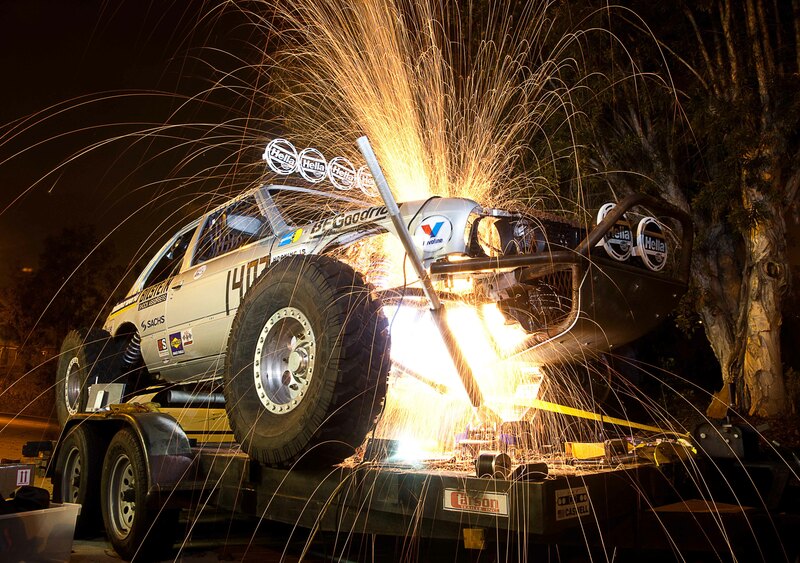 We built the first production BMW for the Baja 1000 and made the start line. We built it with our friends which now includes friends Justin and Heather. The car was fast and fun to drive and felt like an e30. Well it felt like an E30 that could jump 10 feet in the air without exploding. I then moved on to other races. Targa Newfoundland, Lemons, and the Nurburgring. I even qualified for the 24hr race at the Ring but I always kept thinking of Baja and the return of the Pig. So this year we are going back to the Baja 1000. It’s a loop race starting in Ensenada and finishing Ensenada which is perfect for an ultimate DIY run at the largest race in North America. The best part is that we are filming a series called “DIY Baja” with the goal of showing you exactly how you can run the 1000 with your friends as cheap as possible. We’ll show you how we built the car ourselves and how you can build one too. We’ll show you how to set up pit stops and chase routes and hopefully how to finish the race in a vehicle you built yourself. It’s going to be awesome.